What is the Case for Obama Seizing Power? First, let’s look at the facts. Obama has issued many executive orders pertaining to peacetime Martial Law, he has control of drone strikes against American citizens on US soil, and he signed the National Defense Authorization Act into law. Reasons for his actions: unknown. The Department of Homeland Security has recently purchased millions of rounds of ammunition and 7,000 assault rifles. Reasons for these actions: unknown. 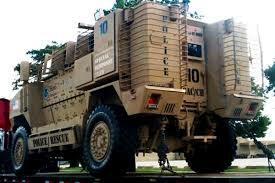 The Department of Homeland Security has recently purchased some 2700 armored vehicles to be distributed all over the nation. Reasons for these actions: unknown. Obama recently had top-secret construction done on the White House (and, using Sequestration for an excuse, has stopped all White House tours, even though Donald Trump has agreed to pay for them for the rest of this fiscal year.) Reasons for these actions: unknown. When Obama and Congressional Democrats discussed Amnesty for illegal aliens, an idea for a possible path for citizenship was for illegals to serve in either the US military, Peace Corps, or Americorp for a period of two years; and then citizenship would be granted. Homeland Security, using Sequestration for an excuse, has started to release illegal alien CRIMINALS without deporting them. The reason for this action: unknown. Fema Camps are built and being built all over the country. Supposed use for these is for storms and times of crisis, such as an invasion of some sort. The reason for these: unknown. Do you have the picture yet? My theory is that Obama is building his civilian army against Americans using illegal aliens, supplied with arms from DHS, with a promise of full citizenship in the NEW USA. After his opposition is either eliminated or imprisoned, of course. The White House will become the new Presidential Palace. This is the only plausible reason for these actions that I can come up with. I sincerely hope that I am wrong. As always, stay safe and be aware of your surroundings. Because the alleged original source is employed by a Government Agency, such as the FBI, DHS, CIA, etc. and he wants to maintain his cover and employment, which is understandable, I cannot personally confirm this or get a second confirming source. It is so important, however, I want to get it out so that the Blogisphere can use all available resources to take it apart and confirm or deny. I can tell you that the person who posted this article FULLY STANDS by it and STANDS by his source, re-confirming this to every single person on the site that he posts to. NOTE: I did ask a whole bunch of additional questions which hopefully will be answered soon. I did some checking and came up with this – the person claiming to have written your posted message above…. Seems to check out as part of this group (see below) and also check their website…. He also seemed pissed which i can understand…. Seems many people were questioning if this was real or not… Still hard to say for sure – I am guessing it maybe….??? First of all I want to say that this report was copied from the Frontiersmen and disseminated to WRAM – we DID not post it to WRAM ourselves. The information was intended for our organization and the other organizations that we network with and had no intention of slapping it all over the web. I do not believe in having to chase down rabbits to correct falsehoods about a story, but I felt the need to do it with this one. #1 – I wrote the report. I hope that clears up who the original source of this story was. #2 – I was incorrect on the Colonel’s name, it is Colonel Salo (ret). I do apologize for the error, but I was working on a phone call immediately after the meeting and must have heard it incorrectly. He is the new BIMA director that took over about a month ago. It was timely info so I posted ASAP without checking the name. A misspelled name is not some sort of obscure Vietnam plot – I did have to laugh at that one. #3 – Photos? You take photos at that facility and you are going to jail. Anyone that knows this facility can attest to that. #4 – I posted a map where this facility was and where the vehicles were positioned, which was confirmed by our boots on the ground. We did have Frontiersmen (unconnected to the source) go to that facility at 5PM – all but 2 of the vehicles have already moved out. They came in and were moved out within a single day. #5 – I gave a date, time (meeting was from 10AM-noon), who attended, the subject matter, and who conducted the meeting – yes, pretty friggin’ vague I would say. And the meeting was held in an auditorium where many attended, not a conference room. If maybe someone out there had a relative or friend that was there, they can validate it for you. Unfortunately I did not get details on what finger foods they offered as a snack or I would have posted that too. #6 – This info came from a personal friend of mine who was in attendance and no, I am not giving you a name. I trust them and those that know who the source is also trust them. That is all that matters to me. Many of the comments in this thread really expose folks for what they are – talkers. I put our name on the report, gave all the details I possibly could, and followed up with additional information and sightings in the original thread. It would have taken anyone here a whopping 5 minutes to contact someone in the Frontiersmen to verify who posted it and where. But no – it is much easier to simply dismiss it out of hand and act like you actually know something. A good question to ask is ‘who is the disinformation agent?’ The guy who posts the info and backs it up or the guy who does absolutely NO RESEARCH and boldly claims ‘this is bunk’? As a national organization that tries to identify and prepare for a variety of emergencies, we get a lot of information. Our members are regular folks, military, law enforcement, EMS personnel, doctors, lawyers, political figures and yes – the dreaded federal agents. We get info every day and we share publically the stuff we feel should be out there. This story validated the fears of many friends of mine who are in the militia movement and so I felt compelled to release it to the public. We fear that a civil war is a real possibility in this nation and want everyone to be prepared to protect their friends and families. As you can see, I get a bit testy when people take information, re-post it, and others (who have no clue) start commenting on the validity of it without so much as even contacting the source. This information had the story’s original author (Frontiersmen) and all the details that I had. The substance of this information can be validated through any person close to the agencies mentioned, or was at the meeting that was held, or anyone else that may be in the know. Comment by Ohio Frontiersmen 10 hours ago on March 13, 2013.